When I first saw a picture of the blanket octopus I did a double take. I’d never heard of a blanket octopus before, which is surprising given the internet’s obsession with both large cephalopods and bizarre animals. A two meter long octopus dressed like a fashion icon certainly falls under both categories. But the truth is, blanket octopuses are incredibly elusive. Very few videos exist, and not much is known about their biology. To help spread the word on these lovely creatures, here are six reasons why blanket octopuses are my new favorite cephalopods. 1) The blanket octopus is stylish. The blanket octopus(Tremoctopus spp.) spends its entire life in the open ocean, and looks like a Cher outfit from the 60s. 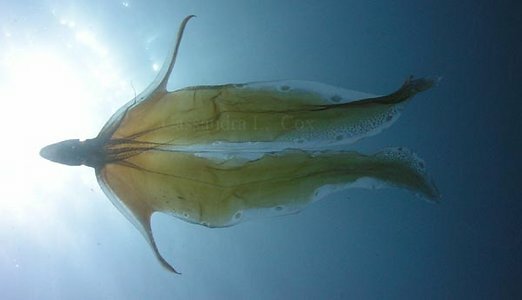 Between the arms of the blanket octopus are long sheets of patterned flesh. When threatened, the blanket octopus extends these fleshy curtains to look like a disco icon. Blanket octopus. Image from Tree of Life Web Project. Photograph by Cassandra L. Cox. Males were first discovered during a “blackwater hang” . Y’know, where scientists go diving in the middle of the night, in the middle of the ocean, while hanging from a rope above the abyss. Oh, and sometimes they have to take a ‘shark stick’ to poke away nighttime predators. No problem. 3) Blanket octopus doods are very romantic. When a male finds a lady he likes, he doesn’t try to convince her that he’s the right guy. Instead, he fills up one of his little arms with sperm, sticks it to her, and breaks it off his own body. She keeps it, and can use it if she wants to. He is very patient like that. He’s all about making her happy. Did I mention he probably dies afterwards? He likes her that much . 4) They have weapons. Young female blanket octopuses literally rip the tentacles right off portuguese man-o-war jellies, and uses them like little octopus nunchuks. Octopuses hold onto these tentacles with their suckers, and the scientist who accidentally discovered this “experienced sudden and severe pain [that he] involuntarily threw the octopod back into the water” . These tentacle weapons may be more than just defensive. Blanket octopuses may actually use these stollen tentacles to stun or kill prey. If you ask me, that is pretty dang clever. 5) They look like superheroes. When a blanket octopus is threatened, as in the video below, it’s all like, “excuse me ladies and gentleman”, unfurls its fleshy bat cape, and swoops into the night like a badass. 6) The ‘blankets’ of blanket octopuses can break off. This may be accidental, or a way to distract predators. Occasionally these blankets are spotted by divers. I can’t imagine what someone might think, finding something like this with no rhyme or reason. Just a beautiful scarf of living flesh, floating in the middle of the ocean. Share the post "Six reasons the blanket octopus is my new favorite cephalopod"
This almost hypnotized me. These creatures are so beautiful and peculiar. Please keep me on your mailng list if you have one. Previous Previous post: All Walrus. All the time.